Wood is given a beautiful, blooming second life in Jean-Luc Godard's exquisitely handcrafted lotus light. Lotus flowers are ancient symbols of rebirth, spiritual awakening, and purity. But in the presence of sculptural light artist Jean-Luc Godard's* exquisite lamp, all we can think about is how beautiful this one is. The lifelike petals. The brilliant color. The almost fiery inner glow. Jean-Luc had long sought a way to transform wood into natural-looking flowers. By thinly shaving maple leaf "petals," then steaming to gently bend them, he finally accomplished his goal. He carves the green pad base by hand. Lovers of botanical art and handmade wooden decor will have two things in common: they've never seen anything like it. And they love it. Handmade in Connecticut. Born and raised in France, self-taught artist Jean-Luc Godard moved to the United States in 1990, and settled in West Granby, Connecticut, to live and work. Influenced every day by the surrounding landscape, his signature work consists of sculpted, nature-inspired elements. His favorite materials are wood and metal, which he transforms with simple elegance. Dust off with soft bristle brush. 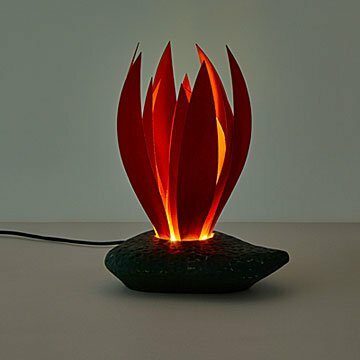 This lamp was bought when I was searching for an organic piece to adorn my bedroom with. Being a lover of nature and an environmentalist, as well as a supporter of local artistry, this was perfect for me. Upon arrival, set up was easy. I only had to plug it in and switch it on and immediately my bedroom was transformed into a tranquil and relaxing space where I could get my work done as well as kick back! I would definitely recommend this to a friend! Build quality and delivery time were both amazing.